Nicholas Culpeper was born in 1616 in Surrey, England into an old noble family. His father died shortly before his birth; and so, his grandfather was the main formative influence in his upbringing. He did his university studies at Cambridge, where he studied for the priesthood, but his heart wasn't in it. Culpeper was in love with a rich heiress of whom his family disapproved, so they planned to marry in secret. On the eve of their elopement, his fiancee was struck dead by lightning, which sent Culpeper into a deep depression. Looking for something to dedicate his life to, Culpeper decided to study medicine, and apprenticed himself to an apothecary in the Bishopsgate district of London. Upon completing his training, he opened up his own pharmacy in a halfway house in Spitalfields, London. 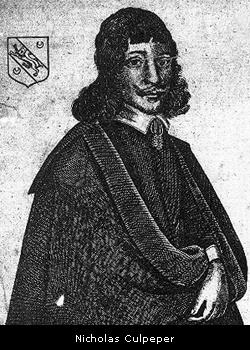 Culpeper was an herbalist who followed the classical medical precepts of Hippocrates and Galen. A medical populist, Culpeper's mission was to put medicine and natural healing back into the hands of the people. According to Culpeper, priests, lawyers and physicians were, by and large, a burden to society, and used Latin to keep their knowledge out of the hands of the public. To put medical knowledge and power back into the hands of the people, Culpeper wrote an unauthorized critical translation of The London Dispensatory in English. In so doing, he aroused the enmity of many powerful physicians, who tried to brand him as a quack and charlatan. 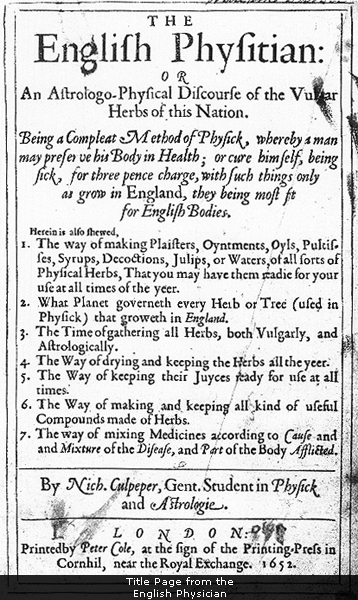 Culpeper also translated Galen's Art of Physick from Latin into English. This work deals with the basic tastes, temperatures and energetics of medicinal substances, and how these properties produce the whole range of therapeutic actions associated with them. Culpeper's best known and loved work is his herbal, called A Complete Herbal, which has never really gone out of print since it was first published. It gives the astrological indications of every herb in terms of planets and signs of the zodiac. According to Culpeper, plants were able to channel and embody the subtle life energies of the planets, which were then consumed as food and medicine. Through an elaborate system of planetary sympathies and antipathies, he found the right herb or formula to treat the patient's illness. "To such as study astrology, who are the only men I know that are fit to study physick (medicine), physick without astrology being like a lamp without oil." "You as an apothecary and physician, you should consult your planetary influences in each patient, to regulate your prescription accordingly. In that case, I am persuaded that more immediate relief will in most cases be afforded the sick and languishing patient. Astrological science should be very useful in guiding your medical enquiries to produce the cure of overt and latent diseases." Culpeper's Herbal is a great resource and reference book. I highly recommend that you buy an expanded edition, which also includes Directions for Making Syrups, Conserves, &c. &c., The English Physician and Family Dispensatory, and A Key to Galen's Method of Physick. It's published by Meyerbooks in the United States and by Wordsworth Reference in the United Kingdom. A Complete Herbal is Culpeper's treatise and alphabetical catalog of the medicinal plants of his native England, including their astrological correspondences and indications. Directions... is a general how-to guide for making traditional medicines. The English Physician and Family Dispensatory starts out with an introductory discourse on Culpeper's system of astrological medicine, then continues with his critical translation of the London Dispensatory; it contains many authentic and valuable traditional medicinal recipes. A Key to Galen's Method of Physick is Culpeper's translation and commentary on Galen's famous treatise on pharmacodynamics, including the Galenic degrees. Culpeper's health in later years wasn't good. He is thought to have gotten tuberculosis from a bullet wound in his shoulder that he received at the siege of Reading. The pressure of his studies and writing, combined with his galloping consumption, finally led to his death on January 10, 1654, shortly after completing The English Physician. I am deeply indebted to Graeme Tobyn's excellent book, Culpeper's Medicine, which has an excellent biography of Nicholas Culpeper in the beginning of the book. It is the essential explanatory companion to Culpeper, for those who wish to understand his work better.